NORFOLK-based TROX UK has more reason than most to be joining the celebrations of Glasgow’s SSE Hydro climbing to second busiest live arena in the world*. The leading designer and manufacturer of HVAC and building service solutions has supplied thousands of components to the state-of-the-art facility, in a contract worth £192,000. Systems integrating TROX fan coils, VAV controllers, grilles and diffusers have been installed throughout the arena, and TROX’s Technical Team has provided unique product enhancements to make this project possible within a demanding time schedule. “This was a superb project for TROX UK to be commissioned on, and provided some strict demands in terms of both timings and installation requirements,” said Neil Addison, for TROX UK. Installation of each of the diffusers typically involves three fixing screws and one central screw. As the Hydro’s staircase and seating areas are constructed in concrete, it required a faster method. TROX’s Technical Team designed a special butterfly bracket which allowed each diffuser to be clamped in place with just one screw, simplifying and speeding up installation. Neil added: “A further requirement for this project was the ability to supply large volumes of components within demanding timescales. Our extensive investment in manufacturing capability over recent years enabled the company to provide the large numbers of products required. The SSE Hydro, designed by architects Foster + Partners, is located on the site of the former Queen’s Dock, Glasgow, and opened on Monday 30 September 2013. It plays host to national and international performers as well as global entertainment and sporting events. With a seating capacity of 12,000, The SSE Hydro will stage around 140 events a year, and will attract an audience of around one million visitors. *In January 2015 it was announced that SSE Hydro had climbed to the second busiest live entertainment arena in the world, in the Pollstar Top 100 Worldwide Arena Venues, rankings. 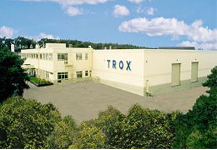 TROX UK is a leading designer and manufacturer of HVAC and building services solutions. With over 50 years’ experience in the industry, it has outstanding design expertise, which places it at the forefront of product innovation. The company works closely with architects, developers and consultants, acting as a valuable extension to any project team. In close collaboration with clients worldwide it manufactures, designs and markets components and systems for ventilation and indoor climate control.